Daleys Fruit Tree has Plants for Sale to Oswald and can Mail Order them to you door. Click to Find out how much Freight Will Cost. 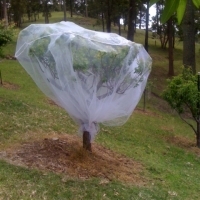 Backyard fruit tree net to protect your fruiting trees from fruit fly, possums, birds, bats and rodents. No need to use chemical sprays, environmentally and wildlife friendly. Suitable for all fruit trees including stone-fruits, apples, figs, guavas, pears, persimmons and tomatoes. The fruit saver net is 2m square with a 2m skirt on all sides.